The super-middleweight division is enjoying a time in the spotlight currently as older champions fade away, newer names come to the fore and tournaments light a fire in the weight class. The limit for super-middleweight is 168lbs and it has found itself to be somewhat of a halfway house between middleweight and light-heavyweight since its inception around the 1970s when a “Junior light-heavyweight” division reared its head and some of the title organisations began taking it more seriously. The IBF and WBA both recognised super-middleweight champions for the first time in the mid-80s and the WBC got in on the act in 1988 when Sugar Ray Leonard boxed Donnie Lalonde for the vacant crown. Bizarrely, Leonard also defended his WBC light-heavyweight title in the same contest. The current belt holders include Caleb Truax who holds the IBF title that he won from James DeGale in an upset late last year. DeGale will look to rectify that loss this Saturday evening when the pair rematch in Las Vegas. Mexico’s Gilberto Ramirez holds the WBO belt that he won against Arthur Abraham and has made defences against the likes of Jesse Hart and Max Bursak, indicating how relatively weak his reign has been so far. Another Mexican, David Benavidez, holds the WBC version of the 168-pound silverware. Benavidez is very big for the weight and has looked impressive in most of his outings, barring his title-winning effort over Ronald Gavril in September, 2017. Benavidez (still only 21 years of age) made no mistake in a recent rematch, soundly battering Gavril for the majority of their 12-round return. 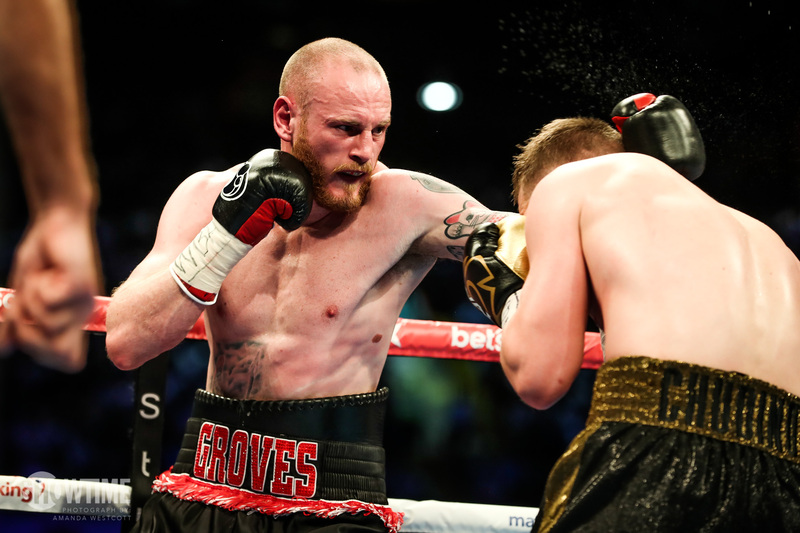 George Groves holds the WBA ‘Super’ title that he won against Fedor Chudinov and defended successfully against Chris Eubank Jr in their World Boxing Super Series (WBSS) semi-final. Groves also took the IBO title from Eubank but refused to accept the bauble after victory. Tyron Zeuge also holds a version of the WBA world titles, seeing as that organisation constantly invents substandard versions of their titles, but nobody really takes these holders seriously as world champions. Other notable names at the weight include Callum Smith who is set to face Groves in the WBSS final later in the year and has been sitting on a WBC number one spot for about three years. Jose Uzcategui is an excellent fighter who emphatically pushed past a controversial first fight with Andre Dirrell (where Dirrell’s uncle attacked the Venezuelan after the fight had been ended on a disqualification) to knock the stuffing out of the boxing brother and take hold of an IBF interim strap. Looking back over some of the more notable champions, Joe Calzaghe and Sven Ottke currently jointly hold the record for title defences, with 21 each of the WBO and IBF titles respectively. Calzaghe picked up the vacant WBO title in 1997 against Chris Eubank (who himself wrote a portion of the weight’s history with memorable battles against the likes of Nigel Benn, Steve Collins and Michael Watson) and defended it for the final time, 10 years later, against Mikkel Kessler. Calzaghe made some solid defences during this time, defeating the likes of Charles Brewer, Byron Mitchell, Robin Reid, Richie Woodhall and, most notably, Jeff Lacy. Joe also defeated some guff over the time period, but many of those names are now largely forgotten about. Wins over the likes of Tocker Pudwill, Mario Veit (twice), Will McIntyre, David Starie (terrible contest) and a foul-fest against Kabary Salem have long been resigned to the memory banks. Ottke himself knew how to negotiate the distance and clocked up a sizeable amount of uninspiring wins over various levels of opposition during his reign from 1998-2004. Ottke twice defeated Charles Brewer, took the WBA title off Byron Mitchell in a unification and defused the threats of decent Scandinavian operators like Mads Larsen and Rudy Markussen, came from behind to dramatically KO Aussie Anthony Mundine, defeated future world champion Glencoffe Johnson and rather controversially outpointed Robin Reid. Man-for-man Calzaghe surely enjoyed the better career on paper but Ottke’s reign was nothing to be sniffed at, although, despite retiring with a 34-0 record, he was never a big puncher (only six knockouts on the slate) and snake charmed his opponents into submission by hitting, holding and winning often by a method of death by a thousand cuts rather than in explosive fashion. Other notable super-middleweights in recent years include: Andre Ward who defended his belt six times over a five year period and won the World Boxing Super Six Series; Carl Froch; Lucian Bute; Mikkel Kessler and Robert Stieglitz. All made at least four title defences at the weight. James Toney campaigned at the weight but arguably did his best work at middleweight. Roy Jones similarly but was a dominant force up at light-heavyweight. Las Vegas’ ‘Fabulous’ Frankie Liles made eight defences of his WBA crown from 1994 until 1999 when Byron Mitchell relieved him of the title by knockout. What is more remarkable about Liles’ run is that he did much of it on the road, winning and defending in far flung places around the globe. Liles found himself in Argentina winning the title against Steve Little before making a first defence in Ecuador of all places against former great Michael Nunn. He went on to defend in Germany, Puerto Rico and even wound up fighting fellow-American Tim Littles in Newcastle, England on a Naseem Hamed undercard. That fight was a rematch (Littles had previously outpointed Liles) and was a real shoot out for the three rounds it lasted – well worth seeking out a copy. Final mention to South Korea’s Park Chong-pal who held the IBF title and recognition as the lineal super-middleweight champion throughout the 1980s.